Our favorite Pin on Pinterest tells us there is a LOT of Aunt love out there, and our Aunt's Heart card is a definitely a crowd favorite. Our 5x7 illustrated card is written from an Aunt's Heart to a new niece or nephew. Each card comes with a white envelope and is blank inside. Select from a pink, blue or organdy bow. 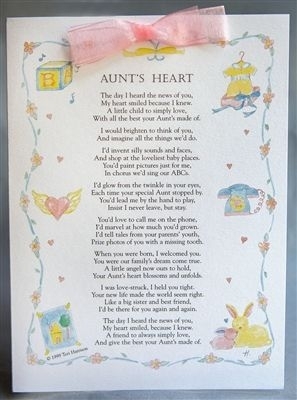 A note about this thoughtful aunt card, it can be given as an aunt or auntie gift as well. This sentiment is so wonderful that Aunt's love to keep and display as well. Card shipping in the domestic US is .99 cents everyday. I loved the card. It had a special meaning for me. Thank you for your prompt delivery. Very nice gifts to choose from, although the shipping took way longer than it should have. On the home page it says usually ships within 1-2 business days, and it took around a week and a half. Aunt heart card was very nice poem and is smaller than i thought.